Each block features a different flower motif in chenille thread embroidered over the piecing so that the effect is three- dimensional. There are cattails, lilies, wildflowers, etc. in the organized square blocks that make up the quilt's interior. There is some erosion in areas where the quilt had been folded (see photos). The overall condition is glorious to look at, but I advise cautious use because of the fragility of these silks, and would prefer to see it hung for display so one can appreciate the skill and beauty of the floral embroidery that is so skillfully done it seems like a web above the lustrous background. "Made January 1, 1893" is embroidered in white thread, to make this an incredible NEW YEAR"S PRESENT for yourself or a lucky recipient. 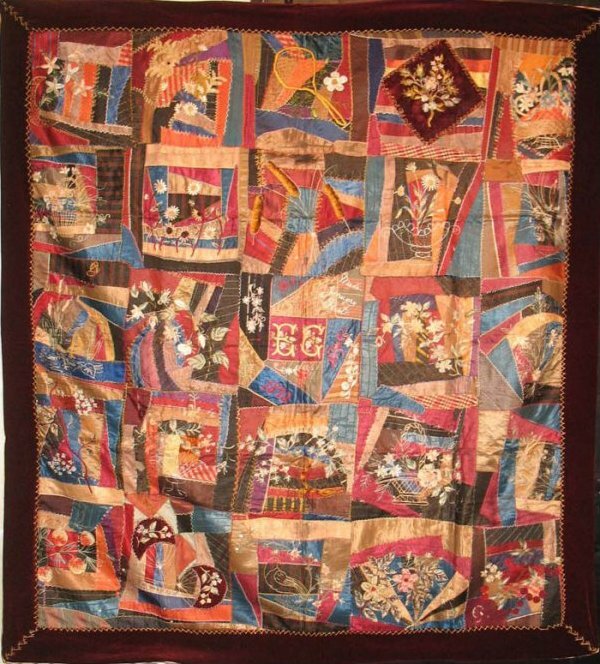 This still-beautiful quilt could ring in any New Year today, more than 100 years later.